We need your help to reach young people for Jesus. Let’s shower the Youth Ministry with Gift Cards! We want to meet our students on the go! 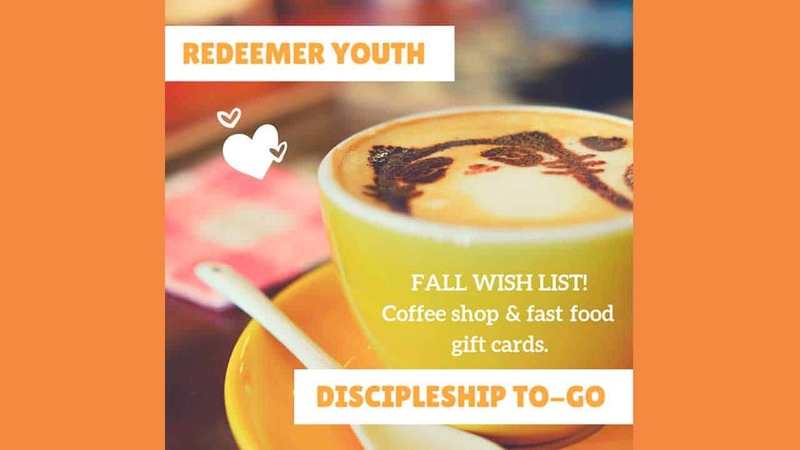 Gift cards to a coffee shop or fast casual restaurant can help create discipleship opportunities for our students and Youth Ministry Team. Help us start new conversations with gift cards from Starbucks, Caribou, McDonald’s, Culver’s. We want to make our Youth Room a welcoming place! Our youth are planning a refresh, and we’d love to stretch our dollars. Help us buy paint and supplies with gift cards from Menards, Home Depot, Lowe’s, Fleet Farm. Look for the gift card box outside the Youth Room. For questions or more info contact Ms. Amy or Mitch. Thank you for making a difference in the lives of Redeemer Youth!